1. It's true what they say. The day preceding, "prep day," is worse than the actual procedure. NO FOOD for 36 hours. Clear liquids. Worst of all, magnesium citrate: two 10-ounce bottles are consumed the day before to, er, get your plumbing going. It's nasty: a carbonated, flavored, sickly-sweet concoction. 2. By dinner time yesterday, I was getting pretty hungry. It didn't help to see Bill eat his dinner. I drank mostly white cranberry juice, water and chicken broth all day. The broth tasted very good: I pretended it was a meal. 3. The nurses at our hospital were fabulous. They told me what would happen. They hooked up the meds and I was out. Thankfully, I don't remember a THING about the procedure. 4. I was told to go home and rest. (This means no cooking for three days, right??) So home we went. I had some scrambled eggs and toast and took a 3-hour nap. And bedtime might be early. Really, the only residual effect is fatigue. Overall, this was not bad at all. Certainly not as bad as I built it up to be. I'm very healthy; I rarely go to the doctor and take no medications. (The nurse couldn't believe it.) But ... the 61-year-old brother of a good friend just died of colon cancer. The brother of another friend has been diagnosed. Trouble is, colon cancer sneaks in with almost no symptoms. So please, if you're over 50, get checked. Then you're done for 10 years. If this big baby can do it, you can, too! I'm off to Nashville for a quick trip to see my dad. Oddly, the night before every trip I take, I desperately want to stay home, especially when I fly. Prayers appreciated, friends! These visits with Dad are never easy, but I'm honored and thankful to spend time with him. After my short "please comment" post on Monday, I didn't know what to expect. They were few, but richly powerful. Who asks for compliments? Only the insecure. But truly, I just hoped for some feedback. Sarah, Lyn and Dove: you were generous in your comments. is enormously encouraging. So thank you. there are very few that receive my regular attention. So thank you when you read. My spirit is joyful and I hope yours is, too. While we're at it, what do you especially enjoy reading? have you placed in our arms: a little girl! I saw tears in Dad's eyes ... you blessed him so. but you must admit it was never dull! that their rough influence made you stronger for life. We had our moments, you and me. Maybe I couldn't quite figure out a girl. I know I was too often impatient. We clashed at times, but I hope you know now that I love you deeply. Your face radiates pure joy and love of Godly friends, and peace. It is what I pray for you as your life stretches before you. Katie, you are a lover of the downtrodden and marginalized. Is there a mean bone in your body? eye, heart and soul move others. OK, I'm your mother, what else would I say? Not everyone has your gift. But many can appreciate and be moved by it. We neither make nor save ourselves. God does both the making and saving. the good work he has gotten ready for us to do, work we had better be doing. sharing and serving and loving your way through this next year. Thanks for you, and for putting up with me. 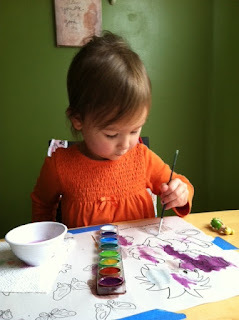 And helping me become an artist, too. Well, in the last 11 posts, there's been just one comment. Are you there? I know you're reading. What do you think? Are you too busy? Have you nothing to say? Have I gone boring and flat? After the sweat of writing, the discipline, the self-imposed guilt, writers really want feedback. I'll keep writing. But I sure would love to hear from you! you need to do it every day or risk starvation. It was back on the road last weekend. Oh, sweet little Lily turned one on February 9. What a year she's had, moving far away from us at 6 months old. I'm feeling a growing longing for my grandchildren. Spending several days with them only worsens my missing them. As children develop personalities, I grow more attached to them. Anyway, some day we might live closer, who knows? So ... photos. I wouldn't end this post without them! (And thank you, blogspot, for fixing the photo problem. She is climbing the stairs with ease. Lily loves a bath, but not too thrilled with her towel. Isn't Jill so beautiful? Motherhood becomes her. What's sweeter than a one-year-old's birthday? And someday they will say, "we looked so young!" 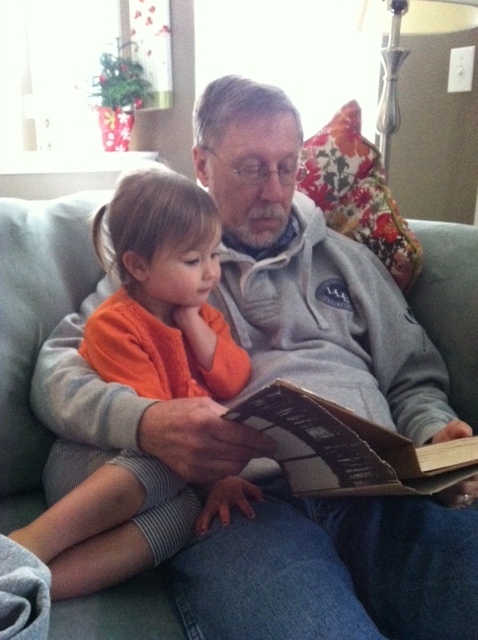 I am crazy in love with photos of me reading to my grandchildren. Thanks for letting us visit, Mark and Jill! Bill and I have never embraced the traditional, commercial aspects of Valentine's Day. In the beginning, he seemed to reject that "someone" like Hallmark dictated a day of love. Then once our children came along, we ended up with three born in January and February; two of their birthdays are six days on either side of Valentine's Day. I was frankly up to my eyeballs in February celebrations. So Valentine's Day took a backseat in our house. Now that we're empty-nesters and having been married for almost 35 years, I've grown to appreciate the everyday expressions of love. Perhaps some won't see it this way, but it's very dear to me. Bill makes the coffee every morning. He gets it ready, but waits until I'm up to turn it on, knowing I don't like coffee that's been sitting awhile. I can't quite admit it, but I don't especially like to do the driving on our long trips. He gladly takes the wheel while I read or nap. Hours and hours. coffee, ice cream, a photo opp, or an interesting shop. lasagna for breakfast with no complaint. I don't think I can recall five meals he hasn't liked in 35 years. A writer needs solitude, time to think and write. He gives me that, day after day. Bill never once asked, "what did you do all day?" He seemed to appreciate that I'd done plenty, even if the house was a wreck. And speaking of that, he never really cared if the house was a wreck. an example of 1 Corinthians 13. Bill will offer to take me out for lunch or dinner. But then, he does that all through the year. That's what endears him to me this Valentine's Day. To see your husband loving your children - and grandchildren - might be the best Valentine of all. Lily and her daddy: February 8 & 9 birthdays! On his birthday one year ago, my son Mark took his wife Jill to the hospital to have their daughter. Lily to decided not to share her daddy's birthday and came into the world at 3 a.m. the next day. So we have February 8 and 9 birthdays in the family, joining three January birthdays and another February birthday! What a year it's been! Tiny Lily, under 6 pounds at a healthy, full-term birth, is still petite but healthy and active. What a sweetheart. She likes for you to work at getting a smile from her, but she is peaceful and content. She "reads" books in her room on her own or plays with her daddy's childhood set of zoo animals. Though not yet walking, she climbs stairs easily and taught herself how to get back down safely. Mark is my strong, quiet son. He's always been the quiet one, intent on his tasks and not very sentimental. He used to hide behind my legs as a toddler and not utter a single word to strangers. Now he's very personable. Love these two: Mark and Lily. May your bond grow strong through the years! Happy birthdays to you both! The challenge with winter of travel, of course, is watching the weather and dodging storms. So our stay in Charlotte stretched into two days when we decided to sit tight and let a January storm pass through first. Good call. When we left Charlotte Friday morning, January 18, there was not a flake on the ground until we reached Virginia two hours away. The Blue Ridge foothills had been dusted with snow, but the higher elevations were like a wonderland. Beautiful! And thankfully, waiting a day allowed the roads to be completely clear for our drive home. Two weeks. 2700 miles. Friends and family and glorious weather. Not an exotic vacation, but the best kind for me. Sweet time with those we love! Next up: more birthdays! 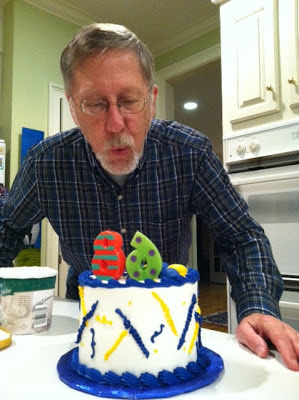 My brother Mark got a yummy cake for Bill's birthday on the 15th. (No, no no ... he isn't 86!!) Then it was off to Charlotte, which was a little off plan ... but Dan had received some exciting news while we were in Florida: being offered his own office ... a HUGE, wonderful blessing! So we just had to run by Charlotte and see the office, the girls, Dan, Jenny and Katie! Jenny keeps these girls busy, busy. They paint, play dress-up, read, do puzzles, play outside and do chores. 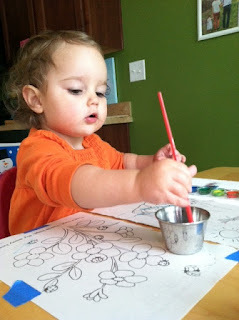 Two and three-year-olds can certainly help around the house! It's just part of daily life and Ari goes with the flow. This is one of my favorites of the trip. Bill was reading "Pilgrim at Tinker Creek." Ari asked him what it was, then got very excited because she's crazy about Tinkerbell. She thought it must be a book about Tinkerbell, crawled up in Bill's lap and asked him to read. Oh my goodness. Our trip was winding down. Two weeks on the road! On Monday, January 14, our longest drive lay before us: St. Petersburg all the way to Greenville, South Carolina. But it was pleasant, punctuated by a brief stop in Savannah, Georgia. We also passed through Gainesville, home of the University of Florida. It has that college-town feel, similar to Ann Arbor, Michigan. A stop would have been fun, but we pressed on. About half-way through our day, we decided to detour into Savannah, Georgia, which has been on my list for years. It's home to the birthplace of Juliette Low, founder of Girl Scouting. So in we zipped ... only to find the birthplace completely covered with scaffolding as it undergoes renovation. Bother! But just a block away is Wright Square, which gave us a taste of old Savannah. Spectacular, ancient oak trees shade the square. I definitely plan to return to explore this magnificent seacoast city. See the old church through the trees? What a bridge! It took us north out of Savannah. that I forgot about photos. But great to see them! The next day was Bill's birthday! We made the most of our last day in St. Petersburg with David. Loved his church! It was full of worshipful energy ... how great to worship with people who love God. And how fun that we had met a dozen or more people Friday night at David's and got to see them again on Sunday morning. David and I headed to the beach for the afternoon. A little bit of haze kept it very comfortable, so I didn't mind the very long walk from the parking lot. Probably 300 yards: what a wide beach! David and I walked, watched the parade of people in, um, interesting swim attire, and read our books. And as always when I go to the beach, I was fascinated by the shore birds. They skitter effortlessly up and down the packed sand, darting just to the water's edge and back as waves come in. As I squatted on the sand and watched these birds, I got to thinking. running with wild abandon toward life's challenges. I have no reason to question what's in the waves. OK, so my metaphor is cheesy? to remind me that he's in charge and has my life in his capable hands. That evening, David took us to Bonefish Grill for our January birthdays. Outstanding! And the company, too. Thanks, David! And so ended our visit to both coasts of Florida. Sadly ... we started north the next day.